How many movies would you pick for a remake before you got to 2000’s Mel Gibson-starring “What Women Want?” One hundred? Five thousand? One million? If someone has been counting towards that exact figure, your work here is done, my friend. On the surface, flipping the gender from “What Women Want” to “What Men Want” is pretty clever. There is comedy gold to be mined in watching a woman have her mind blown by the bizarre random thoughts from guys that she simply passes on the street. Of course, it all could fall flat on its face if the star and execution don’t mesh. It’s not quite pancake-flat, but “What Men Want” is extremely choppy with loads of filler, annoying characters and, for a raunchy R-rated movie, an overabundance of emotional schmaltz. 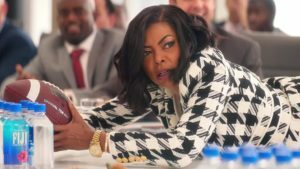 Star Taraji P. Henson is game, and she is not phoning this one in, but as is usually the case with talented actors, the material lets her down. Henson portrays an Atlanta sports agent, Ali Davis. She’s hellbent on becoming a partner in her firm but feels like she’s being held back due to gender and racial politics. While that’s part of the reason, it’s mostly due to the fact that Ali is so power-hungry that she alienates her co-workers and peers, even those that support her such as her assistant, Brandon (Josh Brener). It’s annoying and silly until Ali and her buddies have a sit down with a psychic named Sister (an absolute scene stealing Erykah Badu). Whether it’s the tea, pot or knock on the head, Ali wakes up after the night out and has been blessed with the “hear men’s thoughts” superpower. Initially, it’s slightly funny. It doesn’t last. Ali’s shock builds to nervous breakdown levels, but once she realizes she can take use these powers to her advantage, she quickly embraces the skill. Once Tracy Morgan shows up as the father of a future NBA superstar, “What Men Want” becomes grating. It gets even worse when Ali’s love interest, Will (Aldis Hodge), and his son are used as props to further her career. For every clever scene, such as Ali crashing an all-boys night poker game, there’s a dozen terrible ones. There are entire subplots involving Ali’s friends and one of her co-workers (played by Pete Davidson) that crush any building momentum and do nothing to advance the film. Oddly enough, Henson is at her best when she’s awkwardly stuttering or faking her way to the top of the corporate ladder. As soon as she has to act tough or get all lovey dovey, the entire movie suffers. Henson has some unexpected comedic chops and she elevates “What Men Want” to a much higher level than it deserves. At almost two hours long, “What Men Want” runs out of steam around the 90-minute mark. The last 30 minutes are painfully cheesy and written like a lame PG-13 crowd pleaser. It’s as if the script was rewritten to be a raunchfest, but this team of writers didn’t get to the last 30 pages. Henson definitely has what it takes to be a major movie star, but she’s surrounded by mediocrity this time out.